This production opened on August 15, 2012 and closed on August 19, 2012. Swamp Meadow’s summer children’s production of 2012 featured the Scrumptdillyiscous Magic of Mr. Wonka’s Chocolate Factory! The classic story was full of all the great music, performed with the artistic twists of Swamp Meadow. Performance dates were Wednesday (August 15) at 12:30, Thursday, Friday, and Saturday (August 16-18) at 7pm, and Sunday (August 19) at 2. 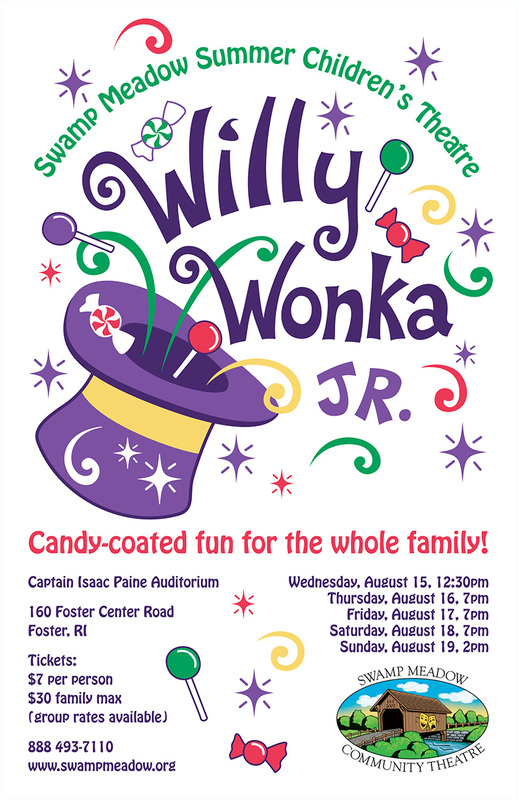 Based upon the beloved book by Roald Dahl, Willy Wonka Junior is a magical adventure through the mind of the greatest candy maker in the universe. Charlie Bucket is a young boy who lives with his poor, but loving family. Charlie’s favorite grandparent, Grandpa Joe, tells him of a wonderful man called Willy Wonka and the delicious candy that he makes in his factory. Charlie’s luck couldn’t be worse, until a contest takes the world by storm; and whoever can find the five Golden tickets will be able to tour Wonka’s mysterious factory. Words and Music by Leslie Bricusse and Anthony Newley. Adapted for the stage by Leslie Bricusse and Timothy A McDonald. Based on the book Charlie and the Chocolate Factory by Roald Dahl. Made available by MTI’s Broadway Jr.